With a drop of over two metres, this garden was virtually unusable. The brief was to create a level garden, which looked fabulous throughout the year. Based on circles we created three distinct zones. An upper sandstone terrace with brick retaining walls lead down sweeping steps to a formal circular lawn flanked with mixed planting for a year round display. A curved wooden sleeper wall allowed us to raise the levels here. 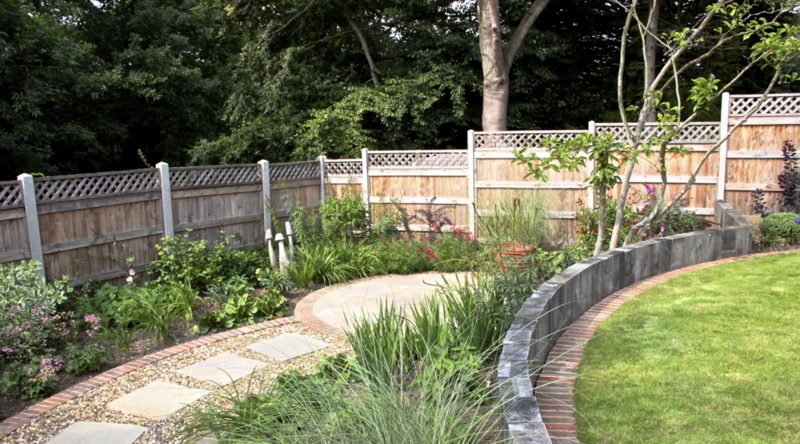 Further steps lead down to a curved gravel path and a further seating area.